A-HA PLAYS IN TEL AVIV 21 JUNE. That is un-musical. The Palestinians beg us to boycott Israel in order to force an end to the occupation and ensure human rights. 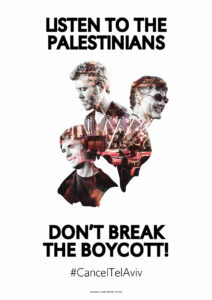 Israeli critics such as «Boycott from within» and the musicians David Oppenheimer and Danielle Raavitzki implores A-ha to NOT play in Tel Aviv. Private letter to A-ha. 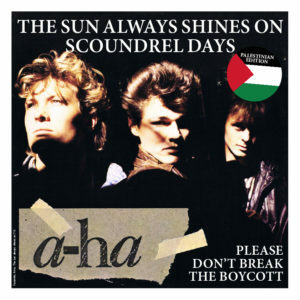 -As a fan of A-ha you can help Palestinians by telling the band this: A-ha, irrespective of your good intentions you will be exploited by the occupant State if you perform in Israel. During their Electric Summer Tour from June till the end of August A-ha will play in the UK, Ireland, Norway, Sweden, Germany, Netherlands, Lithouania, Latvia, Estonia, France and Denmark. Tour itinerary. #CancelTelAviv – Don’t break the Palestinian boycott. We also ask other musicians to state: -Why I am not playing in Israel. Report from academic delegation to Palestinian universities, April 2015. To assist Israel with academic expertise in petroleum technology will strengthen the strategic and economic position of the occupier at the expense of the rights of the Palestinians. The annual urban development conference Oslo Urban Arena has chosen to invite Hila Oren from the Tel Aviv Foundation as a keynote speaker at this year’s conference. We therefore also respectfully ask you leave the conference while Oren talks. Read the appeal with signatures. Initiated by seven Norwegian expert colleagues in the formation of the Palestinian Ministry of Planning, as a follow-up of the Oslo Accords and seven Palestinian planners – co-signed by 95 Palestinian academics and artists who live in Jaffa-Tel Aviv, or have been forcibly exiled and are refused re-entry in spite of being Israeli citizens.